One of the best safari destinations worldwide, Etosha National Park in Namibia offers a spectacular view of the vast Etosha pan, a vast saline desert and its varied inhabitants. 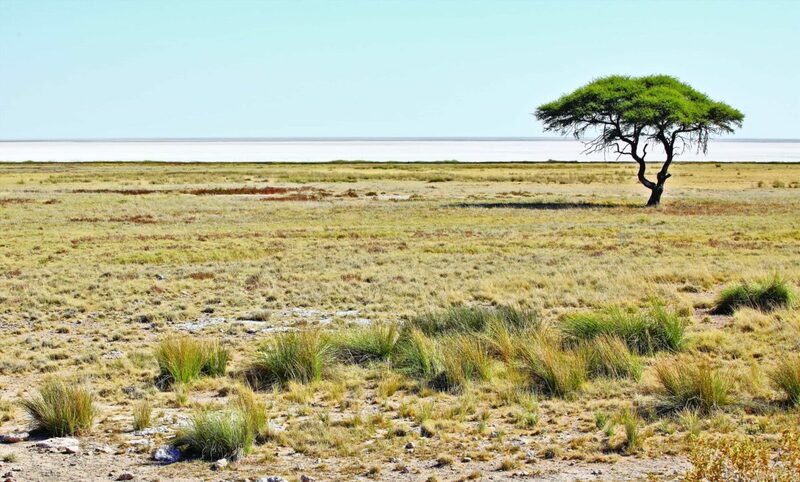 Etosha, meaning ‘great white place’ in the language of the Ovambo tribe, is believed to be this same flat salt pan in the heart of Etosha National Park. The Kunene River once flowed from Angola into the pan, forming a lake, but the course of the river changed due to tectonic plate movements and the lake was deprived of the inflow. Soon, the water in the lake evaporated, leaving the salt behind. Today, the pan covers a vast area of approximately 4,800 sq km. and only contains water after a bout of good rains, attracting wildlife from all over the park. One of Africa’s best national parks, a trip to Etosha comes with guaranteed wildlife sightings. In the dry season, animals from all over the park congregate at the waterholes, giving people the opportunity to see the interaction between different species. The park is especially rich in mammalian wildlife, and home to four of the Big Five. Elephants and Lions are common in the park, while the elusive leopard hides in the densely vegetated areas. However, one of the best reasons to visit Etosha is its healthy population of Black rhinoceros. This archaic beast is endangered and the waterholes are probably among the best places in the world to see this precious animal. But for bird enthusiasts, Etosha can be an absolute paradise as well. The Etosha Pan, which was earlier described as hostile, becomes a haven for birds after the summer rains transform the bleak pan into a vast lake, attracting wetland and migratory birds. The water allows the blooming of blue-green algae, enticing flamingos to come and feed on them. Fisher’s Pan is one of the best birding spots in Etosha. Here you can catch glimpses of the Greater and Lesser Flamingo, Great Crested Grebe, African Openbill, and Yellow-billed Stork. Lilac-breasted Rollers are very common and due to their bright plumage, they are impossible to miss. The Bare-cheeked Babbler, the Monterio’s Hornbill and Rüppell’s Parrot, which is exclusively found in Namibia, are harder to see. In the dry winters, chances of viewing raptors are greater. Goshawks sitting on branches are common sightings amongst tourists. Bateleur eagles can be seen in the azure sky, circling around the area. Also, Tawny and Martial Eagles are often spotted, along with vultures, such as the Lappet-faced Vulture. Various species of owls can be seen after sunset, including Pearl-spotted Owl, the Spotted EagleOwl and the White-faced Owl. Within the national park, there are three rest camps: Okaukuejo, Halali, and Namutoni. All three camps have an artificial waterhole present within, ensuring guaranteed water supply to the animals, even in the parched winters. Situated halfway between Namutoni and Okaukuejo, the Halali rest camp is the newest of the three. Like Namutoni, there is a floodlit waterhole, which can be viewed from an elevated point. A resident leopard dwells around Halali and comes to the waterhole to drink in the dead of night. Okaukuejo is the oldest tourist camp and definitely the most sought-after, besides being an excellent spot to see Lions. Here, tourists can enjoy the spectacular view of the waterhole from the balcony of the chalets, situated not more than 100 feet away. These camps are open all year and contain swimming pools, bars, shops and petrol stations—all the modern trappings you need for your African holiday. The highlights of Etosha are undoubtedly the numerous waterholes present in the park and the variety of wild animals that visit these places. One will rarely find this kind of experience in most other national parks in Africa. In fact, after a few days, I could easily understand the pecking order the animals maintained. Early in the morning, the Impala and zebra were observed, coming in small groups to drink. By midday, the waterhole was teeming with wildlife, when all the animals congregated and came turn-by-turn to quench their thirst. In a stunning moment, zebras, Springbok, Kudu, Gemsbok, jackals and elephants were seen together. In the afternoon, vast herds of Springbok, Impala and Gemsbok came to drink, immersing themselves in the refreshing water to find some respite from the blazing heat. The late afternoon was reserved for the elephants; large herds of more than 20 arrived to quench their thirst. In the evening, the Giraffes appeared, preferring to drink only when the waterhole was vacant. After dusk, a White rhinoceros and her calf were seen. If you are lucky, you may also come across Black rhinoceros and Lions. Close to the Okondeka waterhole, there is a resident Lion pride, which often makes appearances at the waterhole. Gemsbokvlakte is another popular artificial waterhole among the wildlife and we were lucky to catch some action. Since the waterhole is narrow and deep, it is difficult for individual Springboks of a herd to drink side by side. Nearby, the jackals eagerly wait for a Springbok to fall into the waterhole. One unfortunate Springbok did fall in, thrashing around in the deep water, trying to escape. The jackals surrounded it and tried to exhaust it from all the swimming. 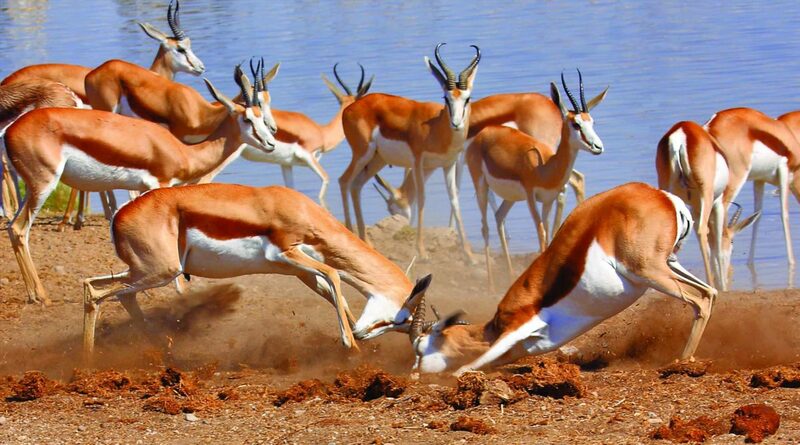 Finally, the Springbok used an ultimate burst of energy to escape from the waterhole and was fortunate enough to flee from the hungry jaws of the jackals. Tourists have observed the tables being turned when the Springbok is too fatigued to continue running after jumping out of the waterhole; the cunning jackals seize this opportunity and make it their next meal. Salvadora, a natural waterhole in a very scenic and beautiful location, is also an excellent place to see Cheetahs. Behind this waterhole, the bleak Etosha Pan and the mirages within can be seen. 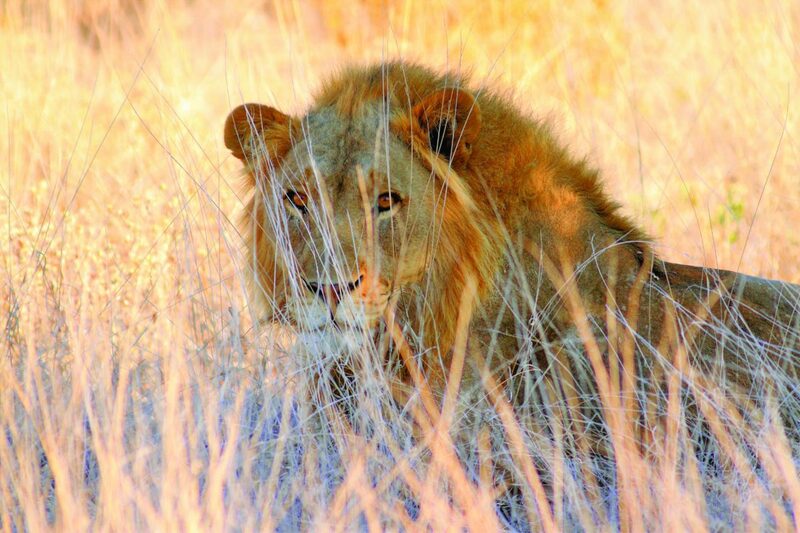 Without any doubt, Etosha National Park can be said to be a photographer’s paradise. It is more rewarding to sit patiently at the waterhole since there is a higher chance of seeing action there than on the game drives. While the prey drinks, predators lurk in the bushes, waiting to attack. The best time to see some action is before sunrise and in the afternoon. Also, from a photographic point, these are the best times to capture the morning and evening light. The waterholes are approximately 15 feet from the viewing area; therefore, a focal length of up to 400mm is generally sufficient. With another dry season gone, Etosha eagerly waits for the rains when the grasses will be green and the salt pan will be filled once more, like it had been thousands of years ago. Take a flight to O.R Tambo International Airport in Johannesburg. Then take a connecting flight via Air Namibia to Hosea Kutako International Airport, Namibia. It is 45km from Windhoek, the capital of Namibia. From Windhoek, Anderson gate, a gate to Etosha, is 459 km, which would take 6 hours by car. There are four gates that lead into Etosha National Park: Anderson’s Gate (closest to Okaukuejo), Von Lindequist Gate (closest to Namutoni camp), Galton Gate and King Nehale Lya Mpingana Gate. The best time for game viewing is July to September, in the dry season. However, for bird lovers, the best time is from November to April, in the rainy season. The temperature in the winter season is around 29°C during the day, and around 9°C during the night whereas, the temperature in the rainy season is around 34°C during the day and 18°C during the night. In the dry winter season, it can get quite chilly, so it is recommended that you take a sweater and a jacket. It is also recommended that you contact a guide, who has knowledge of the park and the various waterholes The park opens at sunrise and closes at sunset. The Namibian Dollar and the South African Rand are only accepted in Namibia. Ria is enthusiastic about the natural world and enjoys wildlife photography.